Cool & Soothing, non-greasy, fast acting for injuries, aches & pains. This non-oily lightly fragranced gel is rapidly absorbed and takes effect within minutes. Apply frequently to injuries or areas affected by chronic pain and stiffness. Ingredients and benefits. 20% herbal infusions: hypericum, arnica, ledum, ginger and phytolacca help to repair damaged muscles, nerves, cartilage and bones. Aids in pain, bruising and stiffness. 2% Essential oils: rosemary, eucalyptus, clove, lavender, camphor and mint help with circulation and to disinfect. MSM( Methylsulfonylmethane) intensifies the effect of pain relievers. Other: Water, glycerine, natrosol (methylcellulose), camphor, methylparaben, propylparaben, polysorbate 20 salt and food grade green. Directions for use: Use Pain therapy gel prior to or during Ultrasound therapy & massages. Safe to use with hot or cold compresses. Apply to insect bites, rashes and burns. Fast and warming pain relief for pain management in muscles and joints. OsteoEze Rub provides a topical alternative for pain management in muscles and joints. It contains Capsaicin – extracted from hot peppers or chilli. How it works. As a result of recent scientific interest, Capsaicin is now classified as an anti-arthritic phytochemical that renders the area to which it is applied insensitive to pain. Evidence suggests that Capsaicin – the active ingredient in OsteoEze Rub – depletes Substance P in peripheral sensory neurons. Substance P is the neurotransmitter that transmits pain impulses to the brain. During this process of high-speed depletion, users experience an initial irritation immediately after capsaicin has been applied. This is the reason why many users have reported that they can actually feel OsteoEze Rub going to work. This effect, known as causalgia, markedly decreases with regular applications of 3 to 4 times daily. A burning sensation might develop if OsteoEze Rub is used less frequently. Recent studies have also shown that Capsaicin decreases prostaglandins – the chemical substances responsible for pain and swelling when the body is under stress. Note: This product is not intended to diagnose, treat, cure or prevent any disease. 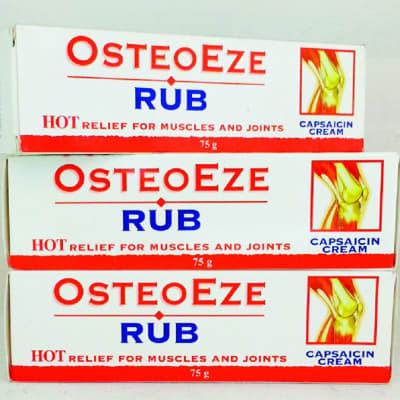 Ingredients Capsaicin	5g (Extracted from hot peppers or chilli) Dosage Using OsteoEze Rub: Apply small quantities of cream three to four times daily to the affected areas. Other information A bandage should not be placed over the treated area. OsteoEze Rub should not be applied to irritated skin or to muscles and joints prior to exercise. It can be used with other medication and is safe to use on a prolonged basis. It is ideal for people who cannot use other forms of pain management. 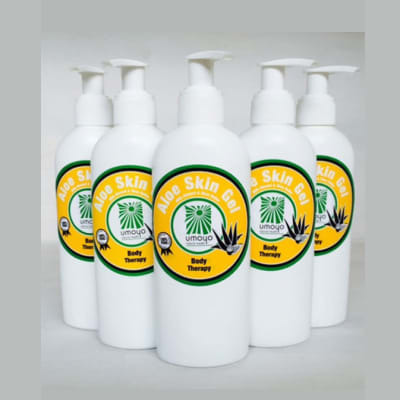 Do not use on broken or irritated skin – or unexposed areas. Wash hands after application. Keep away from the eyes. A soothing gel that combines hot and cold properties to provide muscle and joint relief. 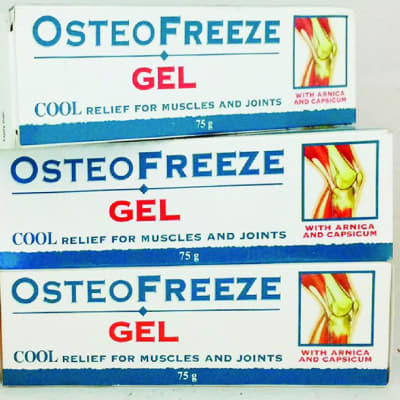 SHARE OsteoFreeze Gel combines some of the actives of the Freeze and Rub to assist the body to curb pain, inflammation and swelling associated with sore muscles and joints. How it works: OsteoFreeze Gel contains Menthol, Arnica and Capsicum. Menthol stimulates a thermal effect and depresses the sensation of pain. Arnica assists the body to counter inflammation, swelling and speed up recovery time. Capsicum has powerful pain-relieving properties. This combination of cold and hot actives delivers a potent combination of actives to assist the body to manage inflamed muscles and joints – and the general symptoms associated with aches, sprains and strains. Note: This product is not intended to diagnose, treat, cure or prevent any disease. Ingredients Each 1ml contains: Arnica Montana flos sicc 10.5mg; Arnica Montana flos sicc	10.5mg; Capsicum frutescens	5.25mg Menthol	36.8mg Dosage Apply a thin layer of gel to affected area 3 – 4 times a day. Wash hands after application. Keep away from the eyes. Capsicum frutescens	5.25mg Menthol	36.8mg Dosage Apply a thin layer of gel to affected area 3 – 4 times a day. Wash hands after application. Keep away from the eyes.